Interested in a different Railroading Journey? Contact us to learn about designing your own custom adventure! Both Arizona and New Mexico owe much of their early development to the Atchison, Topeka & Santa Fe Railway. 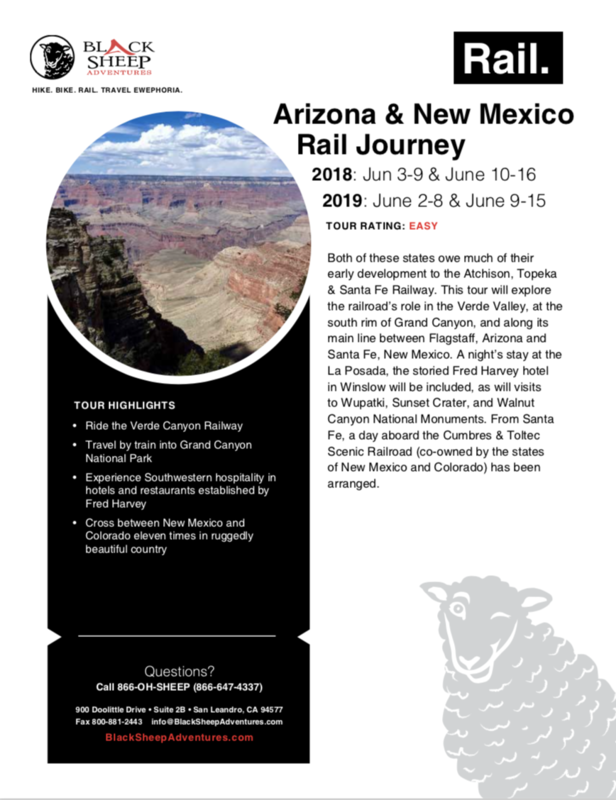 Our Grand Canyon Train Tour will explore the railroad’s role in the Verde Valley, at the south rim of Grand Canyon, and along its main line between Flagstaff, Arizona and Santa Fe, New Mexico. A night’s stay at the La Posada, the storied Fred Harvey hotel in Winslow will be included, as will visits to Wupatki, Sunset Crater, and Walnut Canyon National Monuments. From Santa Fe, a day aboard the Cumbres & Toltec Scenic Railroad (co-owned by the states of New Mexico and Colorado) has been arranged. Located in the center of Flagstaff and a short walk from the Amtrak station. The hotel features free Wi-Fi, the relaxed rooms also have 37-inch flat-screen TVs with premium channels, and private terraces, as well as microwaves, minifridges and coffeemakers. There's also an indoor pool and whirlpool and a 24-hour exercise room. Set in a restored railroad hotel built in 1929 by the Santa Fe Railway, this low-key southwestern-style hotel lies next to the Winslow Amtrak station. The warm, individually decorated rooms offer free Wi-Fi and cable TV. Many rooms feature handmade Ponderosa pine beds, handwoven rugs, and/or original 1930s mosaic-tile baths with cast-iron tubs. Nestled in the heart of the city, steps from the historic Santa Fe Plaza, the Inn on the Alameda is the closest downtown Santa Fe hotel to the Canyon Road galleries. Staying in the Santa Fe boutique hotel near the Plaza means you can unwind completely, tucked within colorful xeriscaped gardens and peaceful shaded courtyards. Well-known for their ample continental breakfast, the Inn also includes a relaxing afternoon wine hour, WiFi access throughout, and a downtown courtesy shuttle for your convenience. The Inn features 72 rooms and suites of various sizes, in distinctive Pueblo-style architecture, gracefully spread across two acres and ten buildings. Additional amenities include an on-site fitness center, hot tub and business center. We meet this evening in Flagstaff, AZ for a welcome dinner and orientation to the week ahead. In 1901 the Santa Fe Railway built a branch from Williams, on its transcontinental main line, to the south rim of the Grand Canyon. 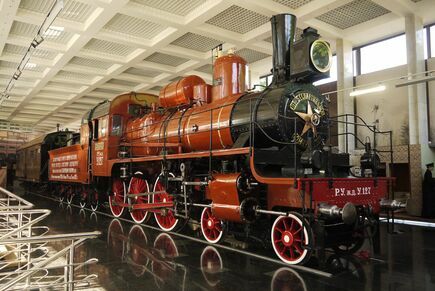 Although the railway ceased passenger service in 1968, efforts to revive it started in 1977 and succeeded in 1989. Re-live the experience of arriving at the canyon by train, have lunch at El Tovar Hotel, then walk along the rim to the Yavapi Geology Museum operated by the National Park Service. Travel to Chama, New Mexico, for a day aboard the Cumbres & Toltec Scenic Railroad. This National Historic Landmark is widely considered the best heritage railway experience in the United States. The 3-foot narrow gauge heritage railroad runs for 64 miles over the 10,015 feet Cumbres Pass and through Toltec Gorge for fantastic views. After breakfast transfer to the Amtrak station or depart for Albuquerque International airport.